The world first truly hypoallergenic medical glove, made from revolutionary new material to eliminate chemicals that cause 90% of allergic reactions. 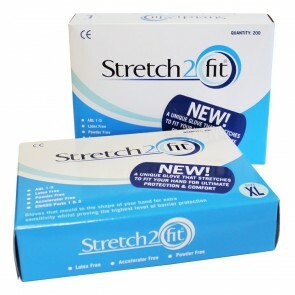 Stretch 2 fit gloves mould to the shape of your hand and are the world's first truly hypoallergenic medical glove. They are manufactured with a revolutionary new material that has a near skin feel about it and eliminates chemicals that cause 90% of allergic reactions. The gloves are suitable for all types of incontinence and will protect your hands from both urinal and faecal incontinence. The unique design allows the palms to receive more air, which causes less sweat when you are wearing the glove. The latex-like feel of the glove gives you more comfort and control without the reactions to latex allergies that some people may have. 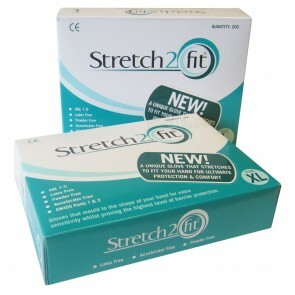 Stretch 2 fit gloves are also latex free, powder free, alcohol-Free and accelerator free. They have also been approved by the NHS to parts 1, 2, 3, 4, of the EN455 European safety standard for medical gloves. The gloves are available in sizes, extra small, small, medium, large, and extra-large and blue and clear colours.